Growing ornamentals and edibles, planting trees and even having a lawn in the garden all make a positive impact on the environment, but some of the products used around the garden can unbalance the benefits these bring. There are some very simple changes that gardeners can make to create a more sustainable garden, from reducing plastic to encouraging more wildlife; Linda Lane from Griffin Glasshouses shares her simple switches to garden more sustainably in 2019. Unfortunately, it is impossible to completely eliminate plastic from the garden and the products we use but we can make a positive effort to reduce the amount used. Start by swapping plastic pots for terracotta or wood, recycling the old pots as you go. Where possible grow plants from seeds, cuttings or by splitting bulbs, this will reduce the amount of new plants you need to buy which are nearly always potted in plastic containers. Harvest and reuse rainwater to use in the greenhouse and around the garden, most Griffin Glasshouses customers choose to include large rainwater tanks that store clean soft water, one of the benefits of using water that has been collected and stored is that will remain at a temperature that won’t shock the roots of plants in the height of summer. There are a number of simple switches that can make maintaining the garden much more sustainable, start by encouraging more beneficial wildlife to help tackle pests such as slugs, snails, aphids and caterpillars, provide food and water for the birds, ensure that there is access into the garden for hedgehogs and choose plants that encourage bees, butterflies and ladybirds, if you have to use weed and bug controls choose varieties that are gentle on the environment. For mowing, pruning and trimming choose battery power over petrol where possible. “By changing a few of our regular practices in the garden we can make a big difference to our environmental impact,” add Linda. 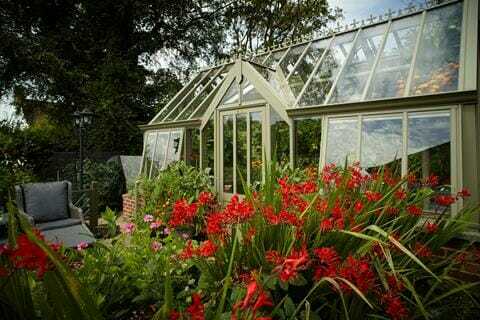 To find out more about the company’s greenhouse collections and bespoke services visit www.griffinglasshouses.com or call 01962 772512.